For those of you who don’t know, Pidgin is an open source Instant Message client which supports MSN, ICQ, the jabber protocol (which means GTalk) etc. 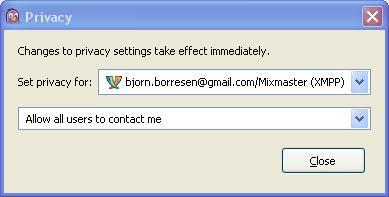 After installing it however, I started getting a lot of MSN spam. You know, IM’s from random people telling me to visit places where I could gamble with my money, or alternatively my health (with cheap pills). Turns out Pidgin defaults to letting everyone contact you. You can change this in Tools -> Privacy. 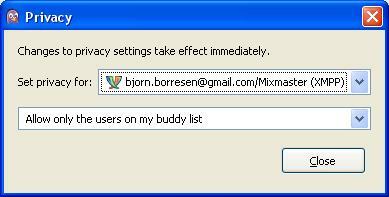 That is, only allowing people on your buddy list to contact you. A linguistically simplified, mixed and restricted language used in limited contact situations between people who have no common language. In addition to that, they can use a Pigeon as their mascot since it’s pronounced the same! I’m in awe.